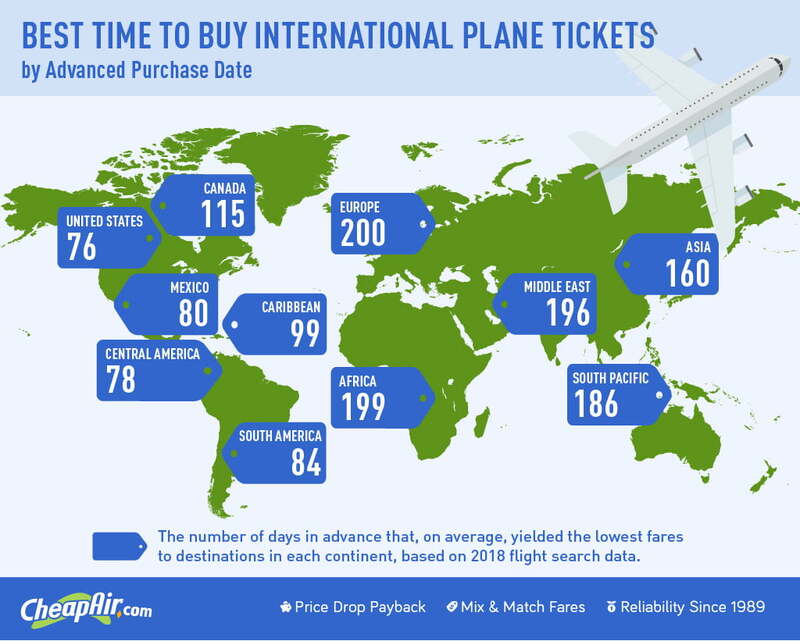 Stressing about when to buy airfare at the cheapest rates for that upcoming trip? A new study could help lower those travel-related cortisol levels. A recent study from CheapAir.com suggests the window of time to buy the cheapest airline tickets is now much longer, and there’s (almost) no longer such a thing as buying too early. The study, which looked at nearly a billion flights, suggests the window to buy cheap flights is now much longer. According to the study, the best time to buy is typically between three weeks form the departure, all the way out to ten months ahead of time, with some variations based on destination. Following the study, CheapAir suggests travelers book within the early to mid part of that window to find the flights with the best schedule. The middle part of that window often has the best prices, but tickets saw little variation, around five percent, for booking in the early part of that window. The study also suggests that flying on a Tuesday and Wednesday is the cheapest departure date for both domestic and international flights. For flights out of the U.S., December and July tend to be the most expensive times to fly, varying some based on the destination. The study also pinpointed several trends based on the destination, suggesting Central and South America as more popular (read: more expensive) destinations while the South Pacific and the Middle East have decreased in popularity. Flying to Canada? CheapAir suggests booking between 43 days and 10.5 months ahead of time, with the cheapest flights departing in January and October. For travelers that are Mexico-bound, between 21 days and 10 months is the best time to book, with September being the cheapest month to fly. Central America’s best time to book is between 20 and 202 days, while South America has a longer 23 to 321 day window. Heading to the Caribbean, 21 to 238 days is the best time to book, the study suggests. Europe’s booking window is best between 59 days and 10 months, Africa’s 112 days to 10 months, South Pacific 21 to 321 or more days, Asia’s 71 to 287 days, and the Middle East 83 days to 10.5 months. The study compiled the recommendations from monitoring the price changes on about 917,000,000 flights. The travel platform conducts a similar study annually.